Home news North Korea: US military to stage evacuation maneuvers across South Korea. North Korea: US military to stage evacuation maneuvers across South Korea. 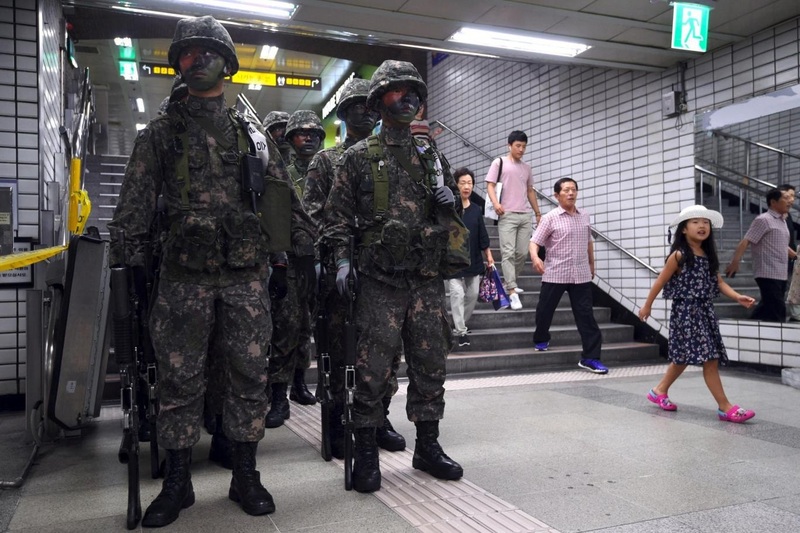 The US military has announced it will practise evacuating Americans from South Korea as tensions continue to escalate in the north. Next week’s drill, known as Courageous Channel, is intended to teach Department of Defence employees and family members how to respond to “a wide range of crisis management events,” including evacuations and natural disasters, according to a statement from the US military. The drill is carried out twice per year, but has attracted more attention of late due to increasing tensions with North Korea. The US military even issued a news release on Sunday to reiterate that the drill is a “routinely scheduled” exercise. Drills will include readiness briefings, document and passport inspection, roster updates, and "limited" rehearsals, according to the military. The scale and focus of the exercises will be similar to past iterations. General Vincent K Brooks, commander of United States Forces Korea, said the exercise is “not directly tied to current geopolitical events,” but stressed its importance nonetheless. “This training is as important to readiness as our other routine events such as tank gunnery and fighter wing exercises,” he said. North Korea made headlines this summer by conducting its sixth-ever nuclear test and launching mid-range missiles over Japan. US President Donald Trump has responded by threatening “fire and fury” on the country. The standoff between the two countries has put North Korea’s southern neighbour in the cross hairs. According to retired US Air Force brigadier general Rob Givens, an estimated 20,000 people in South Korea could die every day in a war between the US and North Korea. An estimated 140,000 Americans currently live in South Korea, according to the Korea Immigration Service. More than 28,00 of those are US military personnel. This week, the US and South Korea launched a five-day joint naval exercise in the waters around the Korean Peninsula. The drill will involve fighter jets, helicopters and 40 naval ships, according to the Associated Press. North Korea views such drills as practise for an invasion. “Such military acts compel [North Korea] to take military counteraction," said Kim Kwang Hak, a researcher at North Korea’s foreign ministry. Repeating a provocative threat from this summer, he added: "We have already warned several times that we will take counteractions for self-defence, including a salvo of missiles into waters near the US territory of Guam."